Bone broth used to intimidate me. How much water do I need for a bone broth recipe? How many onions? What about bones? What kind of bones? Here’s the thing: it really doesn’t matter. 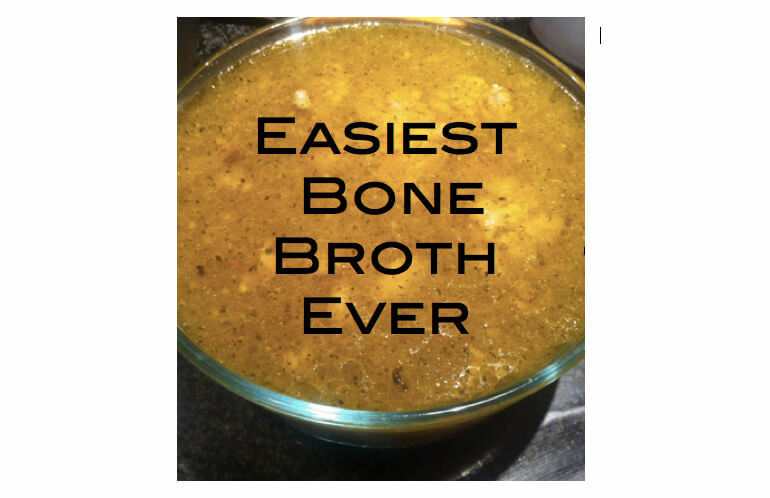 When I started making bone broth I followed all of these complicated bone broth recipes and it ended up tasting like crap. Simplest is always best and bone broth is one of the easiest things to make. This is my recipe for beef broth. 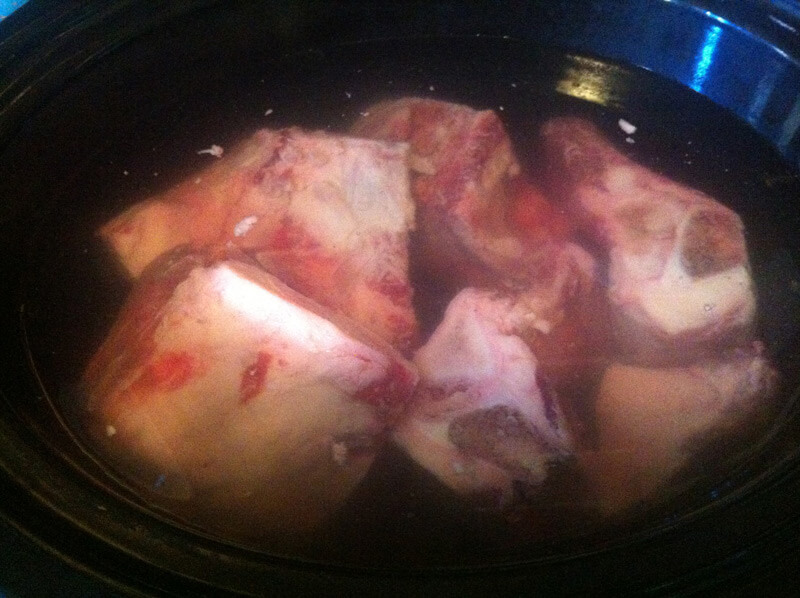 Put bones into the crockpot (this is the one I use and I love it). Add any spices you like. I add a lot of Himalayan salt , garlic powder, and celery seed. Simmer on low for at least 8 hours or high on 3. I guess we could do the same with chicken bones? And also for a veggie broth? Yep! I also add chicken feet to my chicken broth. Chicken feet make the BEST broth EVER! Just rinse ’em well, throw in pot, cook until they literally fall apart and then use a mesh strainer or regular colander to catch all the solid bits when pouring out of pot. This will be the most amazing chicken broth you’ve ever tasted! I’ve made chicken broth this way before. Turkey broth is actually my favorite of them all. Is there a specific kind of chicken to use? I use pastured, organic, local chicken. Where do you get chicken feet? I just saw chicken feet at our local Wal-Mart. Seriously! I’ve seen them in the grocery store. THANK YOU! I’ve been looking and always fall short. I have a recipe from my grandma that she gave me when she was fairly old and frail and it has never turned out – mostly because she didn’t explain how to make the bone broth. For my chicken broth, I put it in the oven overnight at 180 degrees F with an onion and some spices, then in the morning I bring it up to a boil and add some tomato paste and fresh carrots and celery, let it simmer another hour. Let cool. Strain it. I enjoy your posts and am marveling at the bacon debate you have created! I love the overnight oven idea ! Perfect for my wood burning stove 🙂 thanks! Never add salt to your stock/broth. Always do that after making, when ready for use. If you end up reducing your stock for a demi-glace, gravy, or pan sauce, it might be too salty. Most recipes for bone broth I have seen and used list apple cider vinegar as an ingredient, as it helps leech the nutrients from the bones. You didn’t use it. Any reason why? Thank you. I do use it, but it’s not necessary. Apparently people think it’s abosolutely crucial to making bone broth, and it’s not. It DOES help extract some nutrients from the bones, but bone broth is fine without it. Use any bones you want (except human..lol), crock pot, water to cover, any spices you want, and some Bragg’s apple cider vinegar to extract good stuff from the marrow. Cook on low (I like overnight)…let cool, strain and put into containers for freezing. EASY, EASY, EASY! I have actually been making this all week. I was Given a Banana box full of meaty bones and I have 3 crock-pots going right now. I usually let mine go for 24 hours at least. When it is done the bones can be crushed by my thumb. That is when I know it has pulled out plenty of nutrients. And it gels so nicely too. I can’t seem to get it to gel. Should you clarify the broth (remove fat & solid particles) or does that remove any of the nutrients? This can happen for a few reasons: too much water, not enough gelatinous bones, etc. Adding chicken feet to the stock will definitely help it gel. What kind of bones are you using? After the broth has cooled, the fat will rise to the top. I do remove it because I don’t like the taste in the stock, and I reserve it for other things. Hope this helps! Bone broth is so yummy and I might add that when done straining, pour into muffin tins to freeze and then these can be stored in a ziplock to be used as single serve (lunch soup) or as many needed for larger meal. 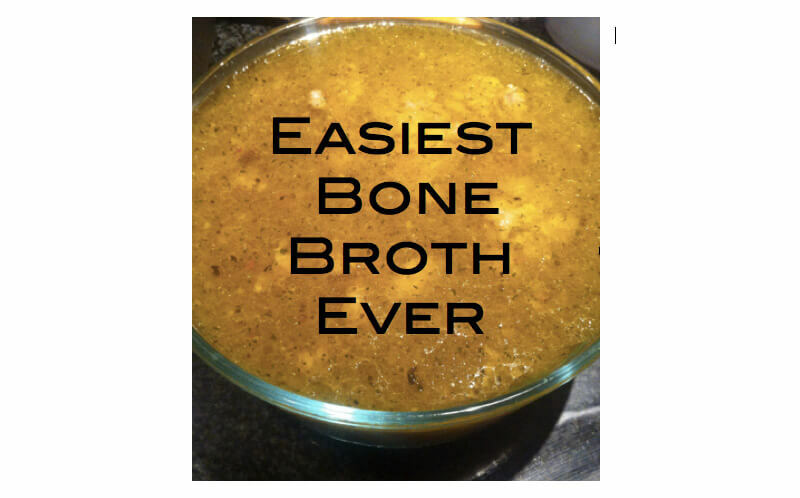 Can you use the bones more than once after you make a batch of broth for another batch? Actually yes you can. As long as they aren’t completely spent. If they fall apart in your fingers. Then no. But always add new ones as well if you reuse. Thank you for making a simplified recipe! I have been wanting to try a bone broth recipe for a while but most websites make it a huge production. I have pork bones from tonight’s dinner and am hoping I like the broth. Thanks again! I like to add turmeric and cayenne pepper to mine for even more flavor. Thanks! I try to drink at least one cup of bone broth a day. Hi Dani! I make my broth in the crock pot just like this, however, I notice that my crock pot gets way too hot on the low setting and the broth ends up boiling within the first 5 hours (which ruins any hope for gel even with chicken feet included). I’m not usually home to alternate it from low to warm settings manually. Do you find that your stock gets too hot in the crock pot? I don’t, it sounds like you may have a faulty crockpot. I did mutton trotters. very nice. I have always done this with the Thanksgiving turkey carcass…”ghost soup” I think my dad called it. Toss in onions & left over carrots & celery from the relish tray…and those leafy bits from the celery (that I can’t toss….freeze…and sometimes end up tossing out when they get too old 🙂 )….best stuff in the world! I made mine today. I been looking for bones…sometimes it’s hard for me to find them. Thanks! I just read another bone broth recipe and the health benefits derived from consuming it and that recipe called for a tablespoon or so of vinegar ( any type). The explanation said that vinegar helps to pull out the nutrients. Where do you buy chicken feet? Thank you for making this simple and easy to understand. I’ve read other recipes for bone broth and it was almost like I needed to be an alchemist. 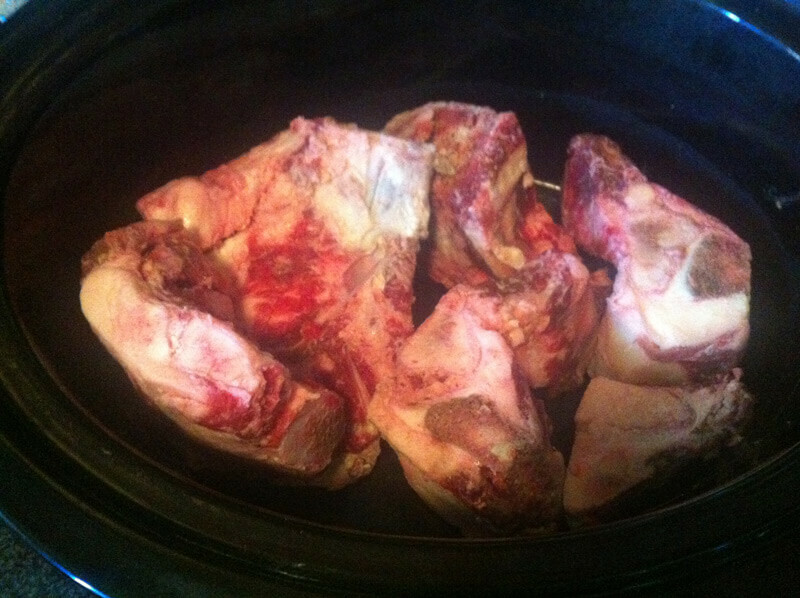 I’ve been saving bones in the freezer for awhile now……ready to make the broth. Thanks! No need to make it complicated, right? I brown my bones in the oven for about 20 minutes to give them a head start, and then everything goes in the pot. I read that putting a tablespoon or 2 of apple cider vinegar over them and putting them before putting them in the oven is a good way to start bringing forth all the extra goodness in them but I haven’t tried it yet. In the pot I put carrots, celery, onions, parsley, seasonings and off it goes simmering. I simmer it forever, skimming the impurities off the top bit by bit. Yum! Yes, ACV brings out the minerals!